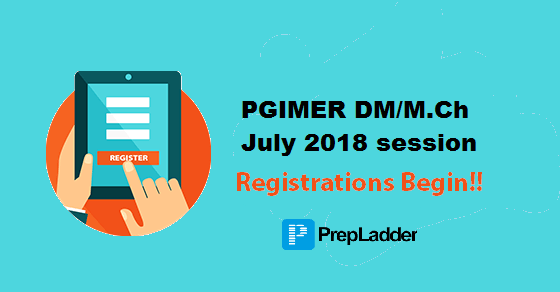 PGIMER DM/MCH January 2018 session: Registrations Begin! Here is an important notification for candidates aspiring for DM/MCh courses as PGIMER (Chandigarh) has released the application form and tentative exam dates for January 2018 session. PrepLadder bring forth this blog to familiarize the DM/MCh aspirants regarding the essential information such as important dates, application procedure, seat matrix etc. Candidates are required to fill application form online which is available on the PGI official website. After completing the application form, the candidates should deposit the application fee either through challan form (Triplicate) in any branch of SBI or through i-collect service. Candidates can visit any SBI Branch with the duly filled fee Payment Challan and pay the prescribed Application Fee in the “Power Jyoti” PUL current account of PGIMER. Candidates having SBI account can also pay their fee through i-collect service in SBI i-collect Account No.- 32222954695. Note: Candidates paying through this mode are required to mention the INB reference No. instead of Challan No. in the application form. Note: The number of seats wherever indicated are provisional and may increase/decrease without any prior notice. Note: Any changes in the admission notice and examination schedule will be made available on the PGI official website and PrepLadder as well. Keep Following PrepLadder for More Updates! !